MORE EXPERTS ARE CORROBORATING WHAT SANDRP HAVE SAID FROM THE BEGINNING ABOUT ROLE OF DAMS IN KERALA’S FLOODS. – “Yes, the rainfall was extremely heavy; much more than Kerala receives at this time of the year. However, the IMD (Indian Meteorological Department) had predicted that the extremely heavy rainfall was very likely and the state should have taken the decision to release water from the dams that were almost full when the rains had subsided in July,” said an IMD official on condition of anonymity. If extreme weather events are increasing under different climate change scenarios and there is not much that we can do to mitigate climate change, we certainly need to prepare ourselves to reduce the risk from such occurrences. The first and foremost step is to have a robust forecasting and prediction system. India has one of the best weather forecasting systems and some of the weather-related observatories are located on the Kerala coast, where the southwest monsoon makes its entry in June every year. The country has world-class remote sensing and weather and earth observation satellites that keep an eye on the Indian landmass. In addition, we have access to imagery from other agencies like NASA. Weather forecast and satellite data need to be used in synergy with ground data from reservoirs and dams to issue flood forecast and warnings. Then these warnings have to be conveyed to people and evacuation, if necessary, needs to follow. In this exercise, multiple agencies at central and state levels — scientific, technical, administration, government departments — are involved. Coordination and action is required in real time. This is where we are lacking. For instance, the CWC — which is in-charge of flood forecasting — has no ground stations in Kerala for this purpose. In addition, as Himanshu Thakkar of SANDRP has pointed out, the magnitude of the disaster in Kerala could have been minimised “if dam operators had started releasing water in advance rather than waiting for dams to be filled up, when they have no alternative but to release water”. Indeed, the Kerala flood has highlighted our poor dam management system: In India’s quest to control water, dams have always loomed large. But for dams to truly tame floods, experts say dam reservoirs need to be relatively empty before the onset of rains. Back in 1924, a combination of heavy rain and a breached dam triggered deadly floods that claimed 1,000 lives. In 2018, history may have repeated itself. 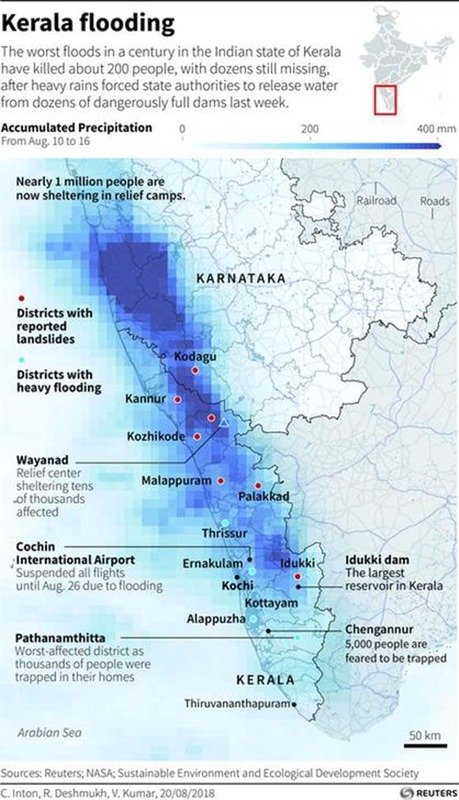 Under relentless downpours, poor dam management may have aggravated the floods, raising questions about the role of dams in Kerala and other states. – According to Himanshu Thakkar, coordinator of the SANDRP, this was not the case in Kerala. The Idukki dam was already near full capacity by July-end even as rains were relatively weak (below normal levels) during that period. – The tragedy in Kerala has highlighted the dangers of excess water accumulation in dams. The argument for dams — that they provide drinking water and water for agriculture — is today scientifically discredited. For independent geologists and hydrologists, dams represent a nightmare, an ephemeral triumph of engineering over common sense and the natural sciences. Increasingly, it is evident that dam proponents are ignoring crucial decision-making data now available on patterns of rainfall, geology and climate change. – Worryingly, dams are far more hazardous than any other infrastructure project, except nuclear plants. It is also accepted today that dams can trigger seismic events. The reservoir-induced seismicity (RIS) from the weight of the reservoir has resulted in earthquakes in various parts of the country: of the 75 cases of RIS reported worldwide, 17 have been reported from India. Our track record in managing floods around heavily dammed rivers, inter-state or otherwise, has been poor. Consider the 2009 floods in the Krishna river basin in North Karnataka and Andhra Pradesh. The heavy rain received between September and October that year resulted in unprecedented flooding of the many semi-arid regions of both states and Andhra Pradesh accused Karnataka of releasing water from its Almatti and Narayanpur dams without adequate notice. Unfortunately, most inter-state basins do not have joint supervisory committees to communicate and coordinate dam releases during heavy rain. Even when they do, as in the case of the Cauvery or the Periyar rivers, they do not seem to be able to respond effectively to sudden heavy rainfall and floods. The failure of the disaster management sub-committee for Mullaperiyar to respond with the urgency required in the present situation is a case in point. The CAG’s report on the 2015 Chennai floods said that excessive release from the upstream tanks was a major contributor and that the rules for operation of the tanks had not been updated for 23 years, not even after the 2005 floods. As per a reader, Ravindranath Dammalapati, Kerala like situation has also occurred in Karnataka and Andhra Pradesh in 2009 due to wrong dam operation, when, after a severe drought, the massive scale of floods occurred in Karnataka and Andhra Pradesh. Irrigation officials termed that event probably the maximum possible flood in 10,000 years. But could it have been better managed? NDTV tracks the causes for the floods. Unprecedented rains in North Karnataka flooded several districts, cutting off areas like Bijapur, Bagalkot and Bellary. Karwar for instance got 50 cm of rain in a single day. Locals called it the heaviest downpour in 50 years.The waters inundated the Krishna and Tungabhadra rivers and the Karnataka govt released upto 8 lakh cusecs of water from the Almatti and Narayanpur dams, in a single day. Srisailam dam, in a single day, had received over 25 lakh cusecs of water in 12 hours, whereas it is designed to get no more than 13.6 lakh cusecs. Next day, the maximum water limit was crossed in Srisailam, Jurala and Sunkesula projects causing inundation in many villages in the backwaters. Kurnool town and several villages in Kurnool, Mahbubnagar and Nalgonda districts were flooded. From the Srisailam dam, the waters were flowing into Nagarjunasagar dam. 10.85 lakh cusecs were released to keep the masonry dam safe. The waters that reached Prakasam Barrage in the coastal Krishna district on Monday have submerged hundreds of villages. Prakasam Barrage has never received such huge amounts of water in the last 100 years. Heavy rain and landslides may have caused a major river tributary in Kerala’s Kozhikode district to split into two branches twice over the past two weeks, intensifying the flooding, water experts said. The branches later merged downstream, a scientist said, adding that extreme rain is unlikely to cause rivers to change course permanently. The tributary named Iruvanjippuzha, which merges with the Chaliyar river, split into left and right branches on August 9 and August 14, V.P. Dinesan, a senior scientist at the Centre for Water Resources Development and Management, Kozhikode, said. Kerala govt on Aug. 23 has told the SC that the sudden release of water from the Mullaperiyar dam by the Tamil Nadu govt was one of the reasons for the massive floods in the state. In an affidavit filed by the Chief Secretary, the Kerala govt said that as the water level crossed 137 feet at Mullaperiyar Dam, authorities in Kerala decided to evacuate on a war footing people who lived in the dam’s downstream. The Chief Secretary suggested that to avoid a repeat of such situations, the Supervisory Committee be headed by the Chairman of the Central Water Commission (CWC) with Secretaries of both the states as members and the panel should be empowered to take decisions by a majority opinion regarding operations during flood or similar crisis. The Kerala govt also sought a management committee to manage the day-to-day operations of the Mullaperiyar dam, to be headed by a chief engineer/superintending engineer of the CWC with both chief engineers/superintending engineers of the two states. TN’s submission to SC on Aug 24 in response to Kerala: Further stating that the water released from Mullaperiyar was not the reason for flooding of the region, the document said, “The storage level in the Mullai Periyar Dam as on June 1 was 115.70 ft. and on August 14 at 8.00 A.M was only 136.1 ft. against the permitted storage level of 142 ft. The inflow was only 4419 cusecs with a diversion of 2200 cusecs through the tunnel to Tamil Nadu. On August 15, when the water level reached 140 ft., spilling of water to downstream of the dam commenced and the initial release was 4489 cusecs. This was gradually stepped up in the course of the day to 8905 cusecs and the average spilling was 14429 cusecs. Indeed, the tendency to store water to almost the full level of reservoirs is becoming a norm among water managers across States. In mid-July, Karnataka, too, started releasing surplus waters from the Kabini and Krishnaraja Sagar dams on the Cauvery system only when it knew that it could not hold any more water. Fortunately, the Mettur dam in the Salem district of Tamil Nadu is big enough to accommodate all the flood flows. For the last one month, Mettur, too, has been releasing excess water flows. 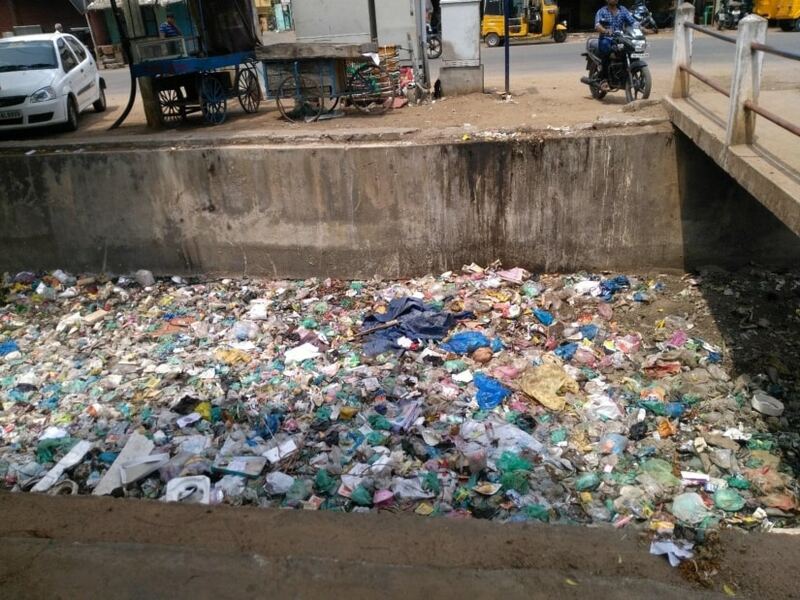 In December 2015, Tamil Nadu also faced criticism for delaying the release of surplus water from the Chembarampakkam tank, causing floods in Chennai. The tension between the two states over the issue has persisted since the 1960s, with Kerala citing concerns regarding the dam’s safety and arguing for the reduction of the dam’s water levels. But with the water from the dam being diverted to five districts in Tamil Nadu and its importance in the state’s irrigation and power production practices, the state has consistently opposed this. “This is a man-made disaster in Kerala. This has happened only because (the) dams were opened without issuing the right warning at the right time. (The Kerala) govt had no assessment of the impact beforehand. No clear evacuation plan was put in place. The state is completely responsible for this calamity,” Ramesh Chennithala, Opposition leader in the Kerala Assembly, told media persons at hurriedly called briefing on Aug. 22. What gives credibility to Chennithala’s words, instead of being seen as an attempt to scoring a political point, are the glaring lapses that have now come to surface in all 3 major dam-river systems that wreaked havoc on the lives of lakhs of citizens over the past week. While the Idukki-Periyar system looks like a case of mismanagement, the Sabarigiri-Pampa system, and the Banasura Sagar-Kabani system’s opening did not warn the people sufficiently early. From the timing of the opening of the big dams to the early warning system that needs to be placed everything seems to have gone for a toss. The hilly district of Idukki has been thrown back by 40 years following Kerala’s worst flooding in a century, Power Minister MM Mani said on Aug. 26. Idukki is also home to some of the major dams which, when their sluice gates were opened after their water level came to choking points, caused unprecedented destruction all over the state this month. Idukki received one of its highest rainfalls starting from the end of May till the middle of August. This pushed up the water levels in the Idukki, Mullaperiyar and other dams. The waters gushing out from the Idukki dam spread out far and wide, damaging everything that came in its way and forcing hundreds of thousands to take shelter in relief camps. – Kerala is usually considered a flood-proofed state with its undulating terrain. For a state that receives an annual average rainfall of nearly 3,000 mm, its natural landscape protects it from recurrent floods. However, the water released from reservoirs upstream compounded the waterlogging caused by heavy and incessant rains this year. Doyang Dam Flooding Assam Update Police quiz NEEPCO DGM Priyabrata Das, the deputy general manager of North Eastern Electric Power Corporation Ltd (NEEPCO), who looks after the operation of the Doyang Hydro Electric Project (DHEP) located at Wokha district in Nagaland, was on Aug. 16 evening questioned by the Golaghat police for nearly ten hours. – Das appeared before the Golaghat police as he was summoned to appear before them. “Das was granted an interim bail by the Gauhati High Court and he was asked to appear before the investigating officer and accordingly he appeared. He said that he operated as per protocol and standard operating procedure,” said Partha Pratim Saikia, Golaghat deputy superintendent of police (DSP) who is also the investigating officer of the case. We will also issue summon to chairman of NEEPCO to appear in the due course of investigation, said Saikia. DAM FLOODS Tamil Nadu 8 shutters of Mukkombu dam on Kollidam river collapse 8 of the 45 shutters of Mukkombu dam (Upper Anaicut) along with the piers have washed away after sudden increase of water in Kollidam river. Officials from the Public Works Department (PWD), river conservation, said that earlier heavy flow of water had weakened the shutters. Efforts are on to divert the entire water into the Cauvery, officials said. A maximum of 1.80 lakh cusecs water was released into Kollidam when the inflow stood at 2 lakh cusecs in Stanley reservoir two days back. Meanwhile, DMK has blamed the state govt for the damage at Mukkombu (Upper Anicut) and said the damage to the sluice gates only showed the AIADMK government’s “negligence” in the maintaining dams in the state. He urged the govt to carry out a survey on the safety of the dams in across the state. DMK alleged that after the Coleroon bridge, the Mukkombu bridge had been damaged because of the AIADMK govt’s indifferent attitude towards the maintenance of the dams. The State unit of the Congress has also urged the govt to constitute a panel comprising experts and engineers to look into the issue of safety of dams across Tamil Nadu, in the wake of the incident. The Stanley Reservoir in Mettur (Salem District) attained full capacity of 120 feet for the second time this year on Aug. 11, after 5 years and there was heavy discharge into the Kollidam from Mukkumbu (Upper Anaicut). The old Kollidam steel bridge built across the flood carrier Kollidam, connecting Srirangam, famous of its temple, with the mainland, developed a major crack in the 18th pier on Aug 15. Owing to the continuous inflow of water, the crack in the 18th pier widened. This had also weakened the 19th pier, leading to the collapse. The old steel bridge, Trichy’s historical landmark, has attracted the general public and tourists for its sheer engineering ingenuity. 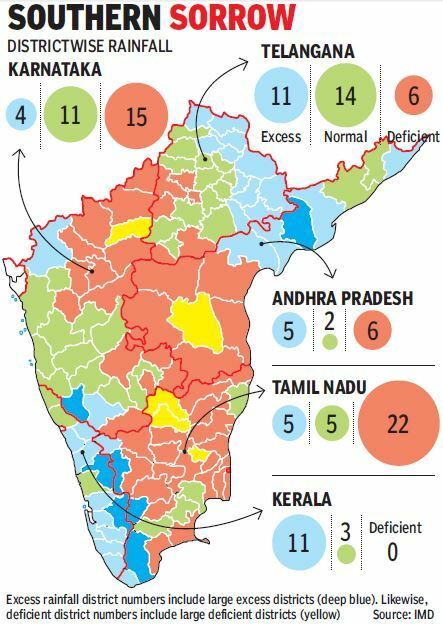 Amid Kerala deluge, fear of drought in Karnataka & TN –Monsoon rain is 7% less in country, but surplus in South India. Met officials attribute the uneven distribution to peculiar features of this year’s monsoon, wherein strong westerly currently brought copious rainfall to the west coast, including Kerala and coastal Karnataka, while low-pressure systems originating from the Bay of Bengal mainly affected central India. – Outside Kerala and coastal Andhra, half the districts in south India are grappling with deficient rainfall. Of the 95 districts in Tamil Nadu, Karnataka, Telangana and Rayalseema put together, 47 have had deficient rain so far (shortfall of 20% or more), including five where the deficit is more than 60%. – Rayalseema is the worst hit. The subdivision has the country’s highest deficit of 42%, having received less rain so far this season than even west Rajasthan. North interior Karnataka is another subdivision in the red, with a shortfall of 21%. – Even in Tamil Nadu, where the overall rainfall of -8% is in the normal range, 22 districts out of 32 in the state recorded deficient rain. – The deficit districts are both along the east coast and in the state’s interior, while most districts along the Kerala border have had excess rainfall. Karnataka too shows the same mismatch between the state’s overall rainfall figure, which is 3% above normal, and districtwise data. Half of the state’s districts, 15 out of 30, have received deficient rain even as Kodagu reels under flood fury. – Telangana has had a good monsoon, with late rains making up for early deficits. Only six out of the state’s 31 districts have major rain shortfall. Rain bounty has also showered on neighbouring coastal Andhra subdivision, which has received surplus rainfall of 21%. – Flood-ravaged Kerala has a monsoon surplus of 40%, with 11 of the 14 districts receiving excess rains. South India is the only region to currently show a monsoon surplus. Uttrakhand Heavy rains were witnessed in most parts of the 7 districts of Garhwal region on Aug. 25 while in Haridwar, the water level of Ganga hovered near the danger mark of 294 m after incessant rain in the area over the past few days. 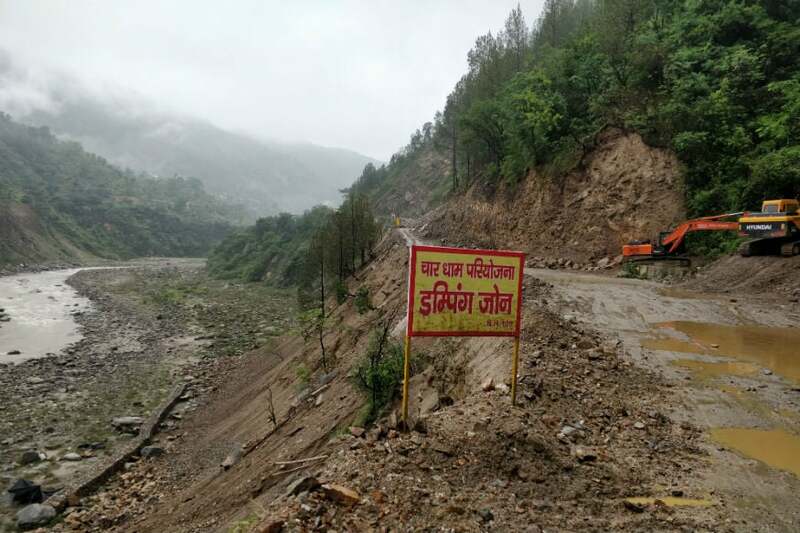 Also, due to heavy landslides triggered by rain in Lambagarh area, the road to Badrinath was closed down. In some areas like Pauri districts’s Kotdwar, rains that had started on Aug. 24 evening continued through Aug. 25, inundating several areas. A woman in Pauri was reported missing after being swept away in a flooded canal in the area. Researchers compiled data on over 4,800 fatal landslides which occurred from 2004 to 2016, leaving out those caused by earthquakes. While the trend is global, Asia was found to be the most-affected continent where 75% of landslides occurred, with a substantial number reported along the Himalayan Arc. Data from the National Remote Sensing Centre shows that a moderate intensity quake measuring 3.4 on the Richter Scale struck Kodagu, Hassan and Chikkamgaluru and neighbouring Kerala, on July 9. Exactly four days later, a low-pressure system began building in the Bay of Bengal, triggering the heaviest downpour in a 100 years, in both Kerala and Kodagu, causing losses of hundreds of lives and damage to crores worth of property, with homes and livelihoods left ruined with little hope of a recovery in the immediate future. Karnataka is now battling a tragedy of enormous proportions, second only to the rain havoc in Kerala. And the worst affected areas are Kodagu and Sakleshpur in which the now blocked Shiradi Ghat is located. Sources say that this oversight on the part of the government, comes after the rejection of the Kasturirangan report, which had stressed on the need to relocate villagers from many places, which ironically, have now been hit by landslides. Himdhara Press Release Last free flowing stretch of Satluj under threat! 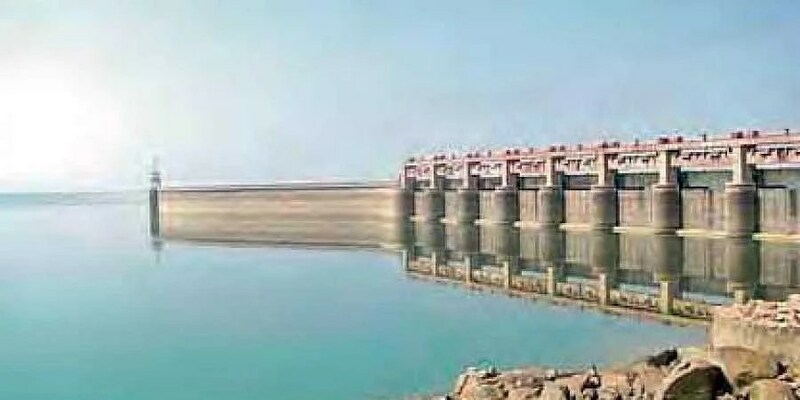 Raising objections to the granting of clearances to dams on the last free flowing stretch of the Satluj River, the Himdhara Collective, has sent a submission to the Expert Committee of Ministry of Environment demanding Cumulative Impact Assessment for individual projects on the Satluj river basin. The committee, in its meeting to be held on 28th August 2018 is to consider the grant of Environment Clearance for SJVNL’s (Satluj Jal Vidyut Nigam Limited) 219 MW Luhri Stage I Hydro Electricity Project, that is proposed downstream of the 420 MW Rampur Project in Shimla and Kullu Districts. The SJVN was earlier to construct a 750 MW project with a 35 km long tunnel in this stretch. DIVERSION OF 79.912 HA. OF FOREST LAND FOR CONSTRUCTION OF KAITH MEDIUM IRRIGATION PROJECT IN FAVOUR OF WATER RESOURCES DEPARTMENT, SAGAR DISTRICT MADHYA PRADESH STATE. PROPOSAL FOR DIVERSION OF 252.754 HA OF FOREST LAND FOR IN FAVOUR OF WATER RESOURCE DEPARTMENT FOR CONSTRUCTION OF JUDI MEDIUM IRRIGATION PROJECT UNDER THE CHHATTARPUR AND DAMOH DISTRICT IN THE STATE GOVT. OF MADHYA PRADESH. Kerala Athirappilly Hydel Power Project Is a Recipe for Disaster, Shows RTI Reply Western Ghats Ecology Expert Panel (WGEEP) recommends that no new dams based on large scale storage be permitted in Ecologically Sensitive Zone 1 as defined by the Panel. Since Athirappilly hydel project sites fall in Ecologically Sensitive Zone 1, this project should not be accorded environmental clearance. Despite this, Kerala’s Athirappilly hydel power project has been the issue of fierce controversy. The Kerala State Electricity Board (KSEB) proposed a hydroelectric dam across the Chalakudy River in Trichur district in Kerala, to generate 163 MW of power. Such was the defiance and arrogance that the then Kerala’s CM has termed opponents to this project as ‘anti-developmentalists’. Gujarat Earthquake hits Bharuch, epicentre near Narmada dam An earthquake measuring 3.7 on the Richter scale, with an epic centre near the Sardar Sarovar Dam built on the Narmada dam in Bharuch district of Gujarat was felt on April 21 evening, official sources said. “The earthquake was epicentered 38 kilometers east-south-east of the Narmada dam and was felt at 4.56 pm. It was one of the larger tremors to hit the region around the dam in the recent past,” an official from Institute of Seismological Research (ISR) told The Indian Express. Data from ISR show that the quake happened at a 5 km depth near a dry river bed close to Panchasim village. Though Kutch and Saurashtra are among the most active seismic zones in the Gujarat, the Sardar Sarovar dam lies near the Narmada rift zone has experienced shocks of the magnitude 5.4 at Bharuch in 1970. According to ISR, the Narmada fault has potential to produce earthquakes of 6.5 magnitude. Tamil Nadu Plea to divert surplus water from dams A petition has been filed before the Madurai bench of the Madras high court seeking the court intervention to divert surplus water from Maruthur and Srivaikuntam dams to the dry regions of Saathankulam, Tiruchendur and other regions in Tuticorin district. According to the petitioner, several petitions from farmer associations were sent to the concerned authorities to address the issue as the excess water from these dams are being wasted into the seas rather than filling up the bone dry regions in the district. Cauvery delta not getting enough water from Mettur dam: Farmers slam Govt Farmers groups and activists have however slammed the government, alleging that corruption and rampant sand mining in the delta region were responsible for the shortage of water, despite the fact Mettur dam is seeing abundant water. Close to 1,70,000 cusecs of water has been released from Mettur dam into the Cauvery this year, but farmers in Karur, Mannargudi, Tiruvarur, Cuddalore and Nagapattinam state that they have not received enough for irrigation purposes. They allege that water is simply draining into the Bay of Bengal due to the government’s unpreparedness. The Public Works Department however denied it and said it is normal for the water to take 75 days to reach tail-end areas. It further added that three major channels of Cauvery River such as Puthiya Kattalai, Uyyakondan and Pullampatti canals have a length of 134 km, 87 km and 90 km respectively. Reservoirs go dry, Chennai stares at water crisis Chennai is staring at a possible water crisis as two of its major reservoirs Poondi and Cholavaram which are prime suppliers of drinking water to the city have gone bone dry. According to the Metro Water website on Aug. 25, the reservoirs have reached their dead storage levels with current water levels in both standing at a dismal 14mcft. As the present volume of all four prime drinking water sources to the city is merely 11% of its total capacity, officials said this will cater to the city’s needs only for the next two and a half months. The combined capacity of lakes at Poondi, Cholavaram, Red Hills and Chembarambakkam was 2.43 tmcft in June 2018. In a month’s time the storage levels had dipped to 1.79tmcft with current level standing at 1.25tmcft as of Aug. 25. As reservoir levels have been steadily depleting since May, the city is majorly dependent on North East monsoons to avoid a water crisis this year end. Apart from these four reservoirs, the city is heavily dependent on water released from Veeranam Lake with 74-77 cusecs of water is being discharged every day into the Porur Lake said officials from Water Resource Department of Public Works Department. Talengana, Andhra, Maharashtra Full Krishna, Godavari dams bring cheer Most of the dams on the Krishna river, lifeline for many districts cross 3 States – Thungabhadra, Almatti and Narayanpur – have filled up, releasing water downstream into Jurala and Srisailam dams. The Nagarjunsagar dam, which had poor inflows in the monsoon season till last week, causing alarm, has seen huge inflows lately with the dam storage level going up to 548.4 ft as against FRL of 590 feet and the storage was up at 207 tmc ft as against full storage capacity of 312 tmc ft. Despite heavy inflows into Nagarjuna Sagar and Sri Pada Yellampally Project (Godavari) which meets over 80 per cent of drinking water needs of Greater Hyderabad and outskirt villages, Hyderabad Metropolitan Water Supply and Sewerage Board has ruled out the possibility of restoring daily drinking water supplies to the twin cities in near future. Because of heavy rains, Nagarjuna Sagar is on the verge of brimming after a long time, as against FRL of 590 feet with a storage capacity of 312 tmcft, the present FRL level is 550 tmcft with gross present storage of water at 210 tmcft. Last year, on the same day, the FRL was 500 tmcft with water storage of 115 tmcft. Similarly, in Sri Pada Yellampally Project (Godavari), as against the FRL of 485 tmcft, the present FRL is 483 tmcft. Of the 20 tmcft of water, the present storage is about 19 tmcft. Though the reservoir got filled up more than a week ago, additional inflows of water is being released downstream. The only worry for the Water Board is Singur reservoir where there have been no rains in the catchment areas of Nashik and Vidarbha region of Maharashtra state. Of the total capacity of 29.91 tmcft, the present available water is about 7.60 tmcft. Finally on Aug. 24, the Water Resources Minister Devineni Umamaheswara Rao said the department was set to release 4,000 cusecs of water for irrigation for farmlands under Nagarjuna Sagar right canal ayacut. The release of water, which is the first time in four years, will help farmers of Guntur and Prakasam districts to go for ‘Magani’ crop during Kharif season, the minister said. Maharashtra Water stock in dams rises to 60 % of total capacity With heavy rains in the last one week, the stock is at 1,119.13 TMC as of August 21, against 1,037.88 TMC on August 13, said the Water Resources Department. The water stock in dams was 53.39 per cent of the total capacity as of August 13, and it increased to 59.17 per cent by August 21, it said in a report. There was a dry spell in the first two weeks of August, but many parts of the state have reported incessant rains in the last seven days, it said. The heavy discharge of water from 12 dams in the Bhima basin has increased the water level in Ujani dam. Over 15 TMC water was added to the dam’s stock in the last five days, irrigation authorities said. 3 dams, Varasgaon, Panshet and Khadakwasla around Pune were full, while Temghar was over 63% full on Aug. 22. Kerala KSEB plans dam break analysis for 3 dams KSEB is mooting a dam break analysis for Idamalayar, Peringalkutthu and Sholayar dams. An emergency action plan, aimed at preparing the map of areas which will be flooded when the shutters of the dams are lifted, will also be prepared. KSEB is awaiting nod from central water commission for awarding Rs 6 crore works to an Australia-based firm in this regard. Odisha Spillway plan for dam safety The environment ministry has given clearance for construction of additional spillways for the safety of the Hirakud dam. The state government will construct five additional spillways at an estimated expenditure of Rs 369.53 crore for release of excess flood water. The spillways will be constructed at the left dyke of the dam and its water will reach river Mahanadi via Gujatala.The state has taken up this huge project for the safety of the dam according to the recommendation of the Central Water Commission. Mahadayi River Water Dispute Karnataka govt to file appeal in SC The Karnataka govt will file an appeal in the SC against the recent verdict of the Mahadayi Water Disputes Tribunal. Vishwamitri, Gujarat On the banks of Vishwamitri or ‘Gutter Ganga’ Through VEDITUM Blog, Jubin Mehta highlights the plight of Vishwamitri River of Vadodara. Originating from the Pavagadh hills, Vishwamitri is a small (135km) but an important river, like all natural water bodies. Over the last many decades, this beautiful river has been reduced to an urban drain. All of the sewage waste from the sprawling city of Vadodara and industrial waste from the major factories in the vicinity is thoughtlessly dumped into the river. Bhiwandi River, Maharashtra College students take up drive to revive lakes, rivers Bhiwandi has more than five lakh power looms and more than 225 dyeing, printing and processing units. Of the 225 units, 45 are large-scale dyeing and printing units. But all effluents from the looms are released into the water bodies. 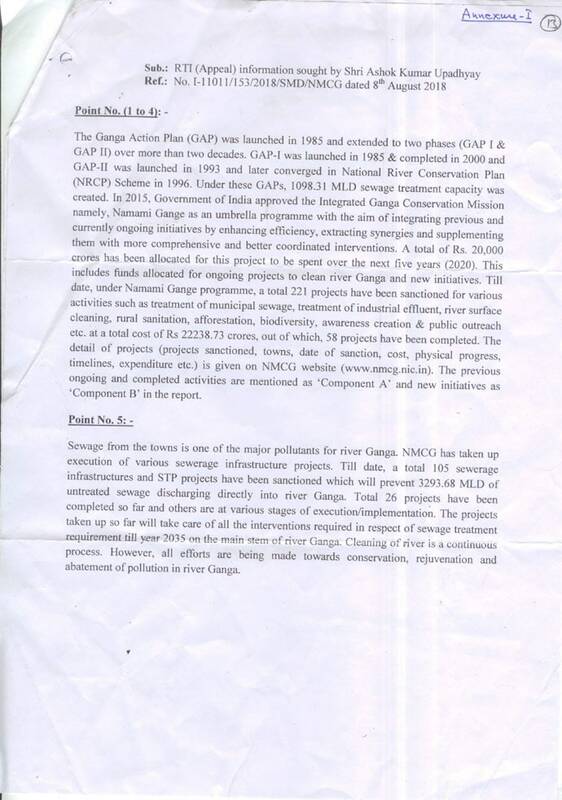 GANGA Namami Gange: In India Today’s RTI response Government of India said, “A total of Rs 20,000 crore has been allocated for this project, to be spent over the next five years (2020)”. It further said: “till date, under Namami Gange programme, a total 221 projects have been sanctioned for various activities such as treatment of municipal sewage, treatment of industrial effluent, river surface cleaning etc., at a total cost of Rs 22,238.73 crores, out of which 58 projects have been completed”. This suggests that an additional Rs 2,238.73 crore has been allocated, with a year and a half to go. The government also admits that so far, only 26 per cent of the sanctioned projects have been completed. Talking about sewage treatment plants, the RTI response says: “Till date, a total 105 sewerage infrastructures and STP projects have been sanctioned, which will prevent 3293.68 MLD of untreated sewage discharging directly into river Ganga. Total 26 projects have been completed so far”. DJB has approved a policy for enforcing decentralised waste water treatment systems across the capital. DJB will now give 90% rebate on sewer charges for those using such plants for water recycling. DJB also approved appointment of WAPCOS as the consultant for rejuvenating 12 waterbodies, commissioning of study for utilisation of 456MGD water from STPs, and sewer and water lines under the sewerage master plan 2031. With the December deadline for the interceptor sewage project drawing closer, DJB has decided to launch an interceptor+ project, which will cover around 200 smaller drains left out of the original plan. DJB maintains 242MGD (million gallon tonnes) raw sewage from the three main drains will be diverted to six sewage treatment plants, making the Yamuna cleaner. Tamil Nadu Miners demand govt to open sand quarries Tamil Nadu State Sand Lorry Owner’s Federation president S Yuvaraj has urged the govt to open sand quarries on dry river courses. “The state requires 20,000 loads of sand for construction activities every day. Of these, 7,500 loads are meant for real estate activities in Chennai, Kancheepuram and Tiruvallur districts,” he said. In the backdrop of the sand mining ban in Kancheepuram and with few resources available in neighboring Tiruvallur, the govt could open more quarries at Villupuram to meet the demand, he added. Mukkombu Regulator Collapse Incident Experts blame lack of maintenance and sand mining leading to the dam collapse The absence of periodic maintenance has been cited as the main reason for the collapse of the 182 year old regulator at Mukkombu. The yearly maintenance covers only painting work and greasing of shutters and chains, and the officials concerned had failed to examine the strength of the regulators. Meanwhile, farmers blamed indiscriminate sand mining for the collapse. Since Mettur dam opens its shutters between June 12 and Jan. 28, it remains idle for the remaining 5 months. During this period, a complete inspection of the dam should be done by the PWD authorities. Since the structures are old, the govt should undertake proper maintenance to keep the system intact, points out Mannargudi S Ranganathan, general secretary, Tamil Nadu Cauvery Delta Farmer’s Welfare Association. He also said that for more than last 10 years, system tanks have not been properly desilted as over the years, the govts have not allocated the required fund for the purpose. Tamil Nadu Lessons from Madurai, a city that adopted tanks and suffered after abandoning them by India Mridula Ramesh Today, many Indian cities rely overtly on the provision of water from reservoirs and a seemingly-never-ending groundwater supply, while not focusing enough on management. Meanwhile, a majority of city dwellers are water-stressed, and water sources are becoming more volatile. NGT directs 5-star hotels to seek permission for groundwater extraction Green Tribunal on Aug. 22 has directed five-star hotels in the national capital to seek permission from the Central Ground Water Authority (CGWA) for extraction of groundwater and inform it about the quantity required by them. A bench headed by Justice R S Rathore also asked the hotels to inform CGWA since when the extraction of groundwater was being done and the monthly quantity taken out by them. Uttar Pradesh Noida’s groundwater level falling by 1.5 metres every year Recent data from CGWB shows water level has been depleting in Gautam Budh Nagar at an average rate of 1.5 metrs every year for the past five years. In Noida region, according to CGWB, the average water table dropped to 24.13 metres in 2017 from 18.22 metres in 2013, while in Greater Noida, it fell to 11.11 metres last year from 7.95 metres five years back. Similarly, in Dankaur, the water level went down to 7.46 metres in 2017 from 5.54 metres in 2013. 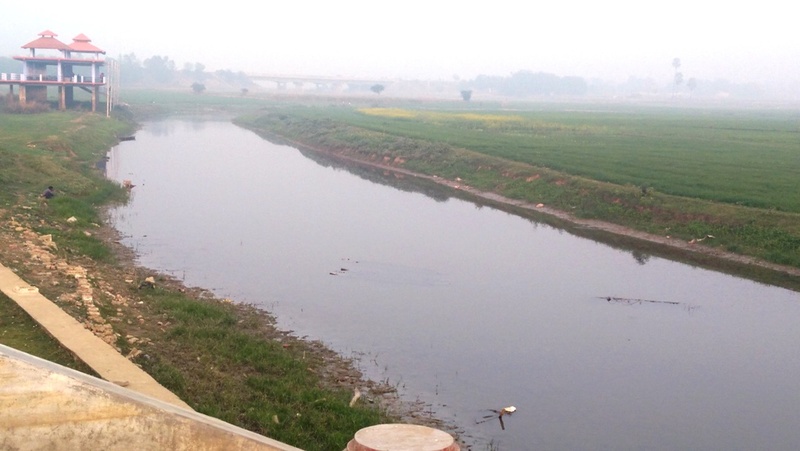 An in Jewar, the water table can down to 5.60 metres last year from 4.34 metres in 2013. Telangana State exploiting 65 per cent of its groundwater resources As per the recently released ‘Dynamic Groundwater Resources of Telangana State’ report for 2016-17, Telangana has 12,361 MCM (436.5 TMC) of groundwater, of which 8,084 MCM (284.5 TMC) was extracted in 2016-17, which is around 65 per cent of the entire groundwater resource, an increase from the 58 per cent reported for erstwhile ten districts of Telangana when a similar report was released earlier in the erstwhile Andhra Pradesh in 2012-13. The report mentions that there are 14 lakh borewells in the state. However, these figures only pertain to registered borewells, mostly used for agriculture purpose, and there must be lakhs of borewells used for agriculture as well as for industrial and drinking purposes, that are not registered under Water, Land and Trees Act (WALTA). Op-Ed In a rapidly urbanizing India, it’s time to re-imagine water in cities By Veena Srinivasan Groundwater from replenished aquifers seeps into streams through the dry season. Cities fundamentally transform the natural water cycle. As land gets paved and green cover disappears, very little rainwater infiltrates. Evapotranspiration is much lower and almost all the rain ends up as run-off. Pakistan Govt to Continue Water Talks with India this Week Pakistan will reiterate its serious objections over two water storage and hydropower projects being built by India during a meet with New Delhi this week in Lahore. A government official told on Aug. 26 said that Indian Water Commissioner P.K Saxena, along with a delegation, was expected to reach Lahore on Aug. 28 to begin the discussions with his Pakistani counterpart Syed Mehr Ali Shah from Aug. 29. 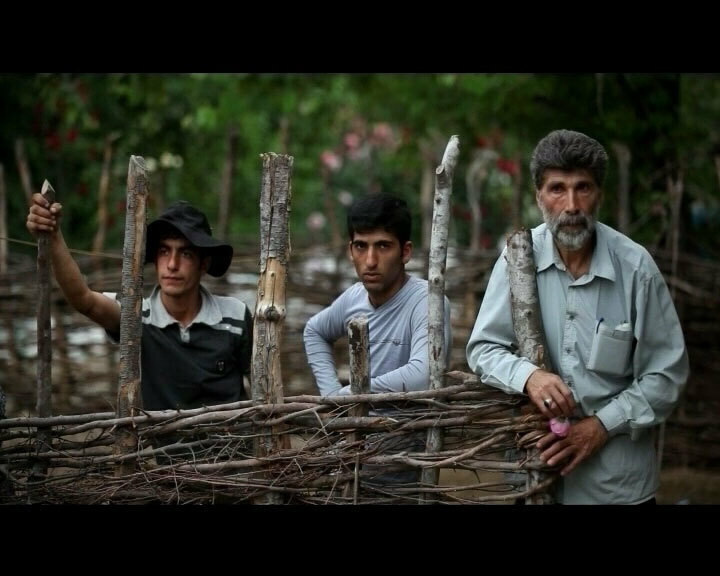 Iran For Iranian Villagers, A Dam Uproots a Rural Way of Life The second-place winner of the 2018 Yale Environment 360 Video Contest depicts the upheaval that comes to a village in northern Iran when construction of a hydroelectric dam forces the resettlement of the population. Depicts the upheaval that comes to a village in northern Iran when construction of a hydroelectric dam forces the resettlement of the population. WWF Report Uncovering sand mining’s impacts on the world’s rivers Reviewing existing scientific papers, the WWF’s research highlighted numerous physical impacts attributable to sand mining from changes in the shape of river beds and floodplains to alterations to instream habitats, groundwater reserves and water quality. In addition, sand mining can result in a reduction in diversity and abundance of fish in mined areas and changes to riverside vegetation. Up to 50 billion tonnes of sand and gravel are mined each year to meet soaring demand from construction and land reclamation – making it the largest extractive industry on the planet. Yet most people have never given it even a passing thought. And nor have most decision makers and river managers. NGT’s new approach to pending cases raises eyebrows Environmental lawyers, says that the NGT’s ‘new trend’ of disposing of cases by setting up committees to monitor issues might not be enough to provide environmental justice. “The NGT is supposed to act as an expert body, but now it is shifting the burden from one expert body to another. This might turn out to be a dangerous trend. It is essential that the strength and capacity of the members for technical expertise is increased as well,” said Mr. Upadhyay. Jharkhand Adani power plant threat to rivers, groundwater Adani has silently procured 1700 acres of land, incl. 1100 acres of farmland, in Jharkhand for its coal based power plant, which will export electricity to Bangladesh. The project document says the plant will consume > 8 million cu.m water every day. They propose a small river, the Chir, as the source, but this river runs dry for 9 months after the rainy season. Obviously, the plant will tap the ground water stock to meet its needs, leaving ca. 40 villages dry and thirsty. The Project Clearance Report is based on examining the Chir’s water, but I discovered its GPS coordinates locate a spot in Neelgi river – some 20 km away! This river, too, is alive only for 3 months of rain… The villagers by this ricer are unaware of any project activity there. That’s how corporations run the world. I collected water samples from both the rivers. Sri Chintamani, Dr. Mithilesh Dangi and Sri Meghnath, who accompanied me in this recky, will file a PIL, based on the hydrobiological and sociological data. Delhi Civic agencies find easy solution for waste problem by burning it The three civic agencies of Delhi have decided to take the easy way out when it comes to dealing with the problem of solid waste – produce energy by incinerating the garbage. By December 2019, the South and North Delhi Municipal Corporations plans to establish two more waste-to-energy plants at Tehkhand and Bhalswa, having a capacity to treat 2,000 and 1,500 metric tonnes of waste. The east corporation is also waiting for approval from the environment ministry to increase the capacity of its existing plant in Okhla, from 1,200 to 2,000 metric tonnes, by November. Previous Post DRP News Bulletin 20 August 2018: While Kerala Is Recovering From Unprecedented Flood Disaster, Will It Be Cauvery Or Krishna Basin Next? India is regarded as having the fourth most advanced meteorological systems. When one looks what the country at first position does, comparisons are meaningless.